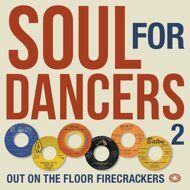 Out On The Floor Firecrackers That Ignited The Northern Soul Boom On Soul For Dancers, journalist (Mojo, Record Collector) and R&B authority Lois Wilson takes a trip back in time to the rare soul scene s roots, to where it all began if you like. Many of the 32 tracks on this 2LP vinyl set filled the floor at Manchester s The Twisted Wheel and London s The Scene Club, both precursors of the Wigan Casino, Blackpool Mecca, The Golden Torch in Stoke et al. The sparks that lit the fuse, these early triumphs would give rise to an era defining scene, one which became a treasured subcultural phenomenon.